The Jobfeed team, which is constantly working on improving the functionalities, look and feel of the portal, just released a new and improved version of Jobfeed. 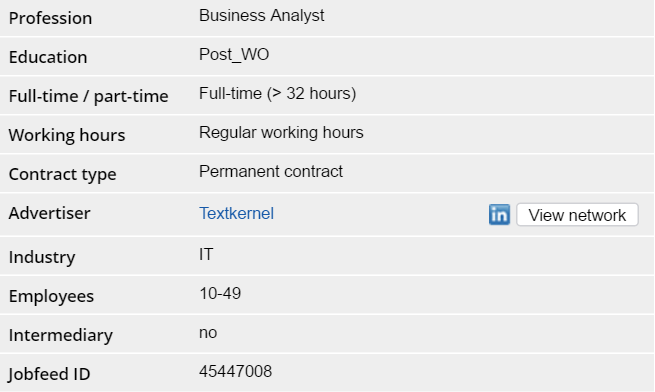 This release includes the possibility to discover who in your LinkedIn network is connected to the advertiser of a vacancy you have found. While Jobfeed already displayed company information from Linkedin, you can now get a list of people within your professional network, working at this company. Simply click on the ‘view network’ button next to the company name in the job summary. This has the potential to accelerate your placements by quickly identifying a contact point within your network which could help you get your foot in the door when approaching possible leads. The account information interface at the top right of the portal has been given a makeover. You can now through a drop-down menu, access your settings and sign out. Want to know more about Jobfeed?